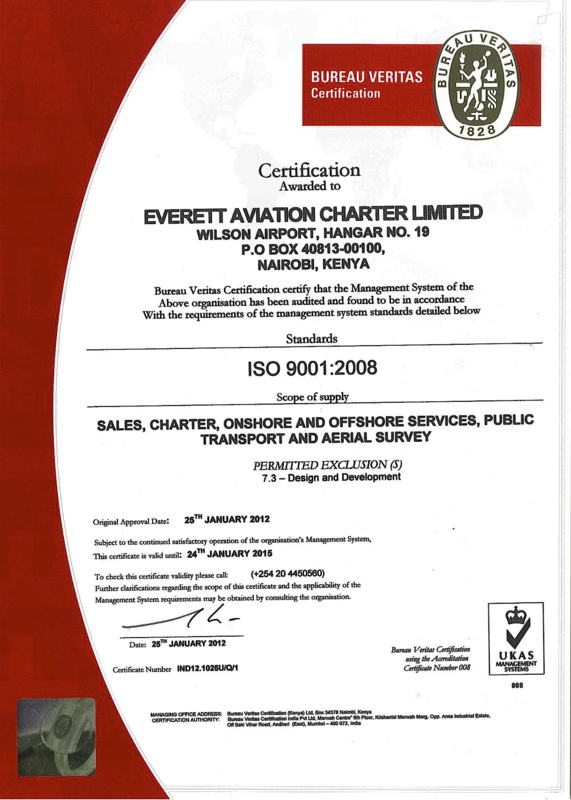 In pursuit of having an effective, efficient and world class standard of service delivery, in 2005 Everett Aviation implemented a Quality Management System the requirements of ISO 9001. The ISO 9001 accreditation is available to organisations that demonstrate the ability to consistently provide a product and / or service that meets customer and applicable statutory and regulatory requirements. 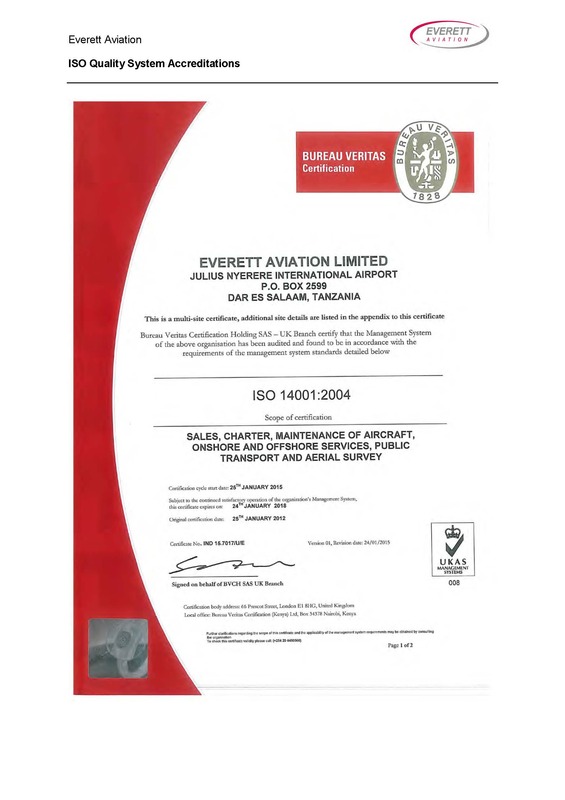 Everett Aviation’s Quality Management System was originally audited and certified to ISO 9001:2000 standard in 2005 by Bureau Veritas. 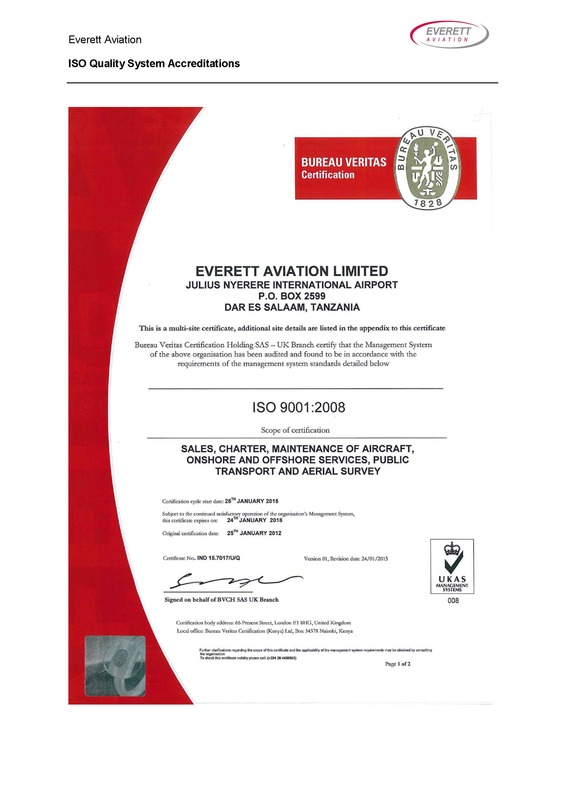 The ISO 9001:2000 standard has since been revised to ISO 9001:2008 and Everett Aviation’s Quality Management System was subsequently upgraded to conform to requirements of the new standard and again audited and certified by Bureau Veritas. Following the successful implemetation and certification to ISO 9001:2008, there was tremendous growth in Everett's business and the quality of its products and services. The Management saw the need to incorporate environmental and occupational health and safety management systems in accordance with ISO 14001: 2004 and OHSAS 18001:2007 respectively. ISO 14001 is concerned with assisting an organization to achieve and demonstrate sound environmental performance by controlling the impact of its activities, products and services on the environment, consistent with its environmental policy and objectives. Similarly OHSAS 18001 is concerned with aiding an organisation in achieving and demonstrating sound occupational health and safety (OH&S) performance by controlling their OH&S risks, consistent with the OH&S policy and objectives. The ISO 14001:2004 and OHSAS 18001:2007 provided an internationally accepted structured framework for reviewing and auditing our environmental and OH&S performance. Since the three standards were found to be compatible, an integrated management system was established and implemented in 2011. 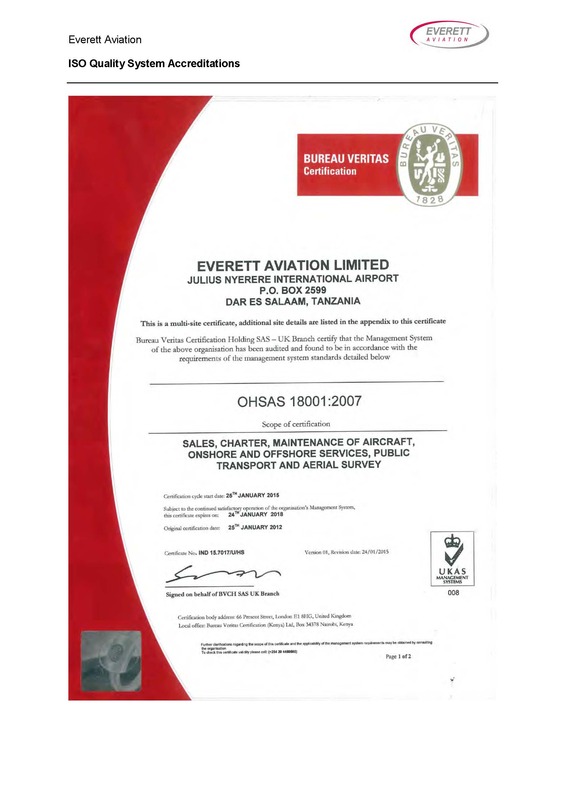 Between November and December 2011, Everett was audited and certified to ISO 9001:2008, ISO 14001:2004 and OHSAS 18001:2007 by Bureau Veritas.